Quark is tasked by a mysterious woman on Bajor to retrieve a box from an abandoned store on the Promenade. The store's owner was murdered several years ago, during the Occupation, a case Odo has never solved. Quark's attempt to retrieve the box unearth old memories for Odo, including how he became security chief on Terok Nor and how he first met Kira. Will Odo finally be able to solve this old crime, and what are the consequences if he does? Perhaps the Cardassian Neck Trick is occurring out of frame? Kevin: There are two main elements to the story, the murder mystery and the character history we get to see. This is one of the rare occasions where two big ideas actually work well together and enhance each other, rather than leave us wishing that they had split them into two different episodes. The character history gives the murder mystery consequence and the mystery provides an elegant platform for exploring the character histories. Nothing is less dramatically interesting than a thin framing sequence around a bunch of flashbacks, so the mystery elements really help make the flashbacks important. Matthew: Indeed, this is really well constructed as a story. Not only do the present scenes offer a good mystery to liven up the flashbacks, but the way the story shifts is really well done, too, with lots of clever scene transitions. I will point out one inelegant aspect of the mystery's progression - Rom says the first "letter" of the first name is a C. Yet the names were clearly written in Bajoran. Is Rom transliterating? Is the universal translator? Kevin: The mystery, obviously going for noir, is largely successful. We get strung along effectively, with sharp, organic dialogue, starting with Quark's conversation with "the Vaatrick woman," through to the moment where we see Odo meet Kira and we realize the episode is likely to have some larger implications for the character. I liked that everyone's actions made sense and were explained where appropriate. Why does Dukat bring in an outsider? Odo tells us at the end, after he figures it out. 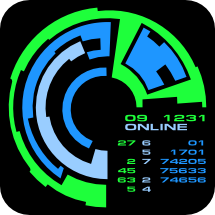 I loved little tidbits like Odo "reconstructing" the list from phone and bank records. It's actual, non-magic detective work, and it makes the payoff worth it. Matthew: Agreed. The dialogue feels natural, but also succeeds at both advancing the plot as well as developing characters. I really enjoyed the story, but the nit-picker in me couldn't help but notice more nits: how could people who had made so much money with the Cardassians during the occupation have eliminated all reference to their activities with the exception of one list? I could see the list being important in the past, but not in the present. And why did the assassin try to kill Quark with a pillow, when he had just killed a Bajoran guard with a knife? Secrecy wasn't paramount, speed was. Well, come to think of it, his motives were unclear to me generally. Was he in it for hire? He certainly couldn't have cared about Bajoran sympathizers, since he was willing to murder an innocent security guard in cold blood. We also get yet another energy weapon that somehow eludes the weapon sensors. Maybe it's time to just eliminate that useless story device. Kevin: What really elevates the episode is that we get to both see how Quark, Odo, and Kira meet, and the episode actually has an impact on their current relationship. Kira rebuffing Odo's imagined advances, Odo seeing through her lies, and Kira forcefully telling him he has to pick a side are all really interesting. Odo letting Kira go when he decides she didn't commit the murder, even though she did commit the sabotage was great because it demonstrates rather than merely talks about Odo always going by his own rules and sense of right and wrong. The last scene is great, and I really empathized with both characters. Kira's reluctance to confess and Odo's hurt at the deception are both realistic, and the final moments of the episode are appropriately quiet and moving. Other character notes I liked were the increasing development of Rom beyond mere stooge. Matthew: I totally agree, and think that this more than the mystery itself is what is great about this show. The characters are subtly different, in really interesting ways, and it's a good shorthand that develops them as real people with lives that extend into the past as well as the (onscreen) future. The final scene, in the present, really did a great job of showing us that the characters still reflect on their prior actions - showing characters being reflective is a really good way to make the world seem real. Real people do this sort of thing all the time - reflect, preen, regret. JJ Abrams characters do not. Kevin: I also liked the back story we get on the Occupation. The station feels different in flashback despite being the same sets, and I believe this is the first time the explicit notion of Bajoran collaborators is mentioned, and it adds an interesting layer to the story. 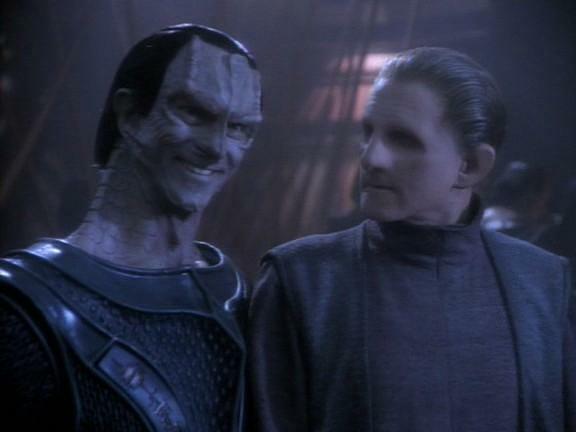 And seeing Dukat in his element was great. The facade of concern for the Bajorans and the menace underneath are really fun to see. I also like that flashback Quark is always a little tattier than current Quark. It underscores one of the eventual arcs of the character that despite his outward groaning at the Federation, his life is actually better now, even if he wouldn't say it to their face. Matthew: Dukat is the really interesting element, because he really hasn't been given much to do in the past 2 seasons. I get that he is preserving a network of sympathizers, but he also comes off as somewhat morally ambiguous in his actions and dialogue, as opposed to just being scheming and evil. Definitely a great move for the character. Kevin: I think it's safe to say that Nana Visitor has really hit her stride with her portrayal of Kira. No shouting, just a really quiet intensity. Particularly in the interrogation scene with Odo and the scene at the end, you really bought how strongly she felt just beneath the surface of the portrayal. Auberjonois was really great as the hard-boiled gumshoe. I liked watching him solve the mystery rather than having it solved for him. You can actually see gears turning in his expression, no small feat given the latex appliances. Matthew: Yeah, he really has the voice for it, doesn't he? I wonder if he was cast in great part on his voice, because the creators knew Odo would be somewhat hard boiled. Visitor showed great facial control in the final scene, making her lip quiver. It was really effective, and she has really stepped up as the premiere actor in season 2. Kevin: Katharine Moffat as Mrs. Vaatrick was great. She was a great femme fatale. Seductive but intelligent, she really made her scenes for me. Marc Alaimo is always a treat. I wonder, like Duet with the obvious historical parallels, anchoring the episode in an actual art form of film noir gave everyone something to hang their hat on acting-wise. Matthew: Either Marc Alaimo or Andrew Robinson should have been in every episode of this series. I don't really know what to say beyond that. They are just so much more interesting as performers than any other guest stars. And than a good half or more of the main cast members. They command a scene and compel you to watch. Kevin: I also want to single out Shimerman and Grodenchik for doing the good kind of Ferengi comic relief. Rom regretting saving Quark is funny because it's in character, brief, and provides a nice gag to offset a dark episode. It's well executed, thoughtful comic relief and both actors, even with just a smile, did a great job. Matthew: I really liked their scene breaking into the shop, too. They had really good timing back and forth, as Rom divulged unsuspected abilities to Quark. And Rom's screaming was hilarious. Kevin: Terok Nor looks really good. The fences and extra grating in combination with the neon lights and fog really give the station a different feel in the same space. The amount of extras were great too. The result was too make the Occupation feel like a long, slow grind rather than a single event. It also oddly suits the Cardassians. The gray skin almost glows in this set-up where everyone else looks washed out. Matthew: I agree. The re-do of Quark's bar was particularly conspicuous. I think it's too bad that we never got to see Ops, or at least Dukat's office. Kevin: I loved Mrs. Vaatrick's hair-earring-dress combos. I liked the thunderstorm and the noir cinematography. The only thing they were missing was horizontal blinds or make a Packard with its high beams on. Part of the fun of this episode for me is how effectively and completely it evokes an atmosphere, and the production team outdid themselves in both past and present scenes. Matthew: The hair and wardrobe on Kira was really good. Like, "why in God's name didn't they let her keep the hair?" really good. Similar kudos go for Odo's outfit, and the Bajoran extras in general. I will say I thought that some of Vaatrick's present day outfits were a bit over the top. If being a collaborator were really such a danger in the present, why would she risk such ostentation? Kevin: I agree with Matt that this episode lacks a science fiction element, and if it were successfully included, would make the episode even better. Had they done just a well executed character history or mystery, I would like, but probably not love the episode. I can overlook the lack of hard sci-fi because they so successfully merged the two elements. They managed to find an interesting and novel way to get out some necessary exposition about the characters, and that skill and thoughtfulness puts this into the top 10 % for me. This is a 5 for me. Matthew: Lack of science fiction is a definite minus for me, and has demoted my ratings of several episodes before this to 4 status, but I also think the mystery itself had a few admittedly non-fatal, but still significant, flaws. Kind of like the modern chase movie that relies on a computer disk or hard drive (just copy the damn thing), I feel like the list is more of a device for the story than a real element that characters realistically interact with. I also have a really hard time believing that, among such a vindictive race with so little else to do, that only a paper list would reveal just who collaborated with the Cardassians. Anyway, it's enough to make me call this the very highest of 4's. This episode is loads of fun and definitely builds characters. But it doesn't activate that special neural region that the best Star Trek does for me. That makes our total a 9. I was always fascinated by Mrs Vaatrik's fashionable earring choices. Most Bajorans we see take the symbolism of the specific earring they wear quite seriously as part of their religious life and family ties. She picked what went best with her outfit. Also, it's sad that we didn't hear Odo make log entries more often. I loved them. Yes, yes, but with whom do you agree on the final rating? Well, since I'm willing to hand-wave away the "it starts with a C!" to the universal translator being its usual creative self, and I don't think that every episode has to have a hard sci-fi element (and a hard sci-fi element might well have diminished this episode), I'd have to give it a five. I will admit that the existence of the list baffled me. But sometimes Evolution of the Plot™ trumps all, and it's not enough to knock down a whole point for me. It's hard to do a flashback episode that is as engaging as this. Yes, I like finding out character histories, but this did that *and* told a great current-day story. They managed a noir setting that was complete enough that I didn't get bored and start looking around for Dixon Hill; I just enjoyed all the atmosphere and the little shoutouts to Columbo. The little elements that they introduced were lovely, too. The Cardassian Neck Trick that's never explained, the details like the origin of Kira's calling Odo 'Constable', Dukat's expertise at knowing who needs to do what job and for what political reason... it was delightful. And I loved the way they let the last scene just hang and end. Much better than if they'd tried to fill it with more words. This has been given a podcast label, but... is it missing or am I missing it? Thanks for the catch. Completely forgot to upload the podcast. I updated the post with the link. Enjoy. Alright, now that I've listened to the podcast, I see why the question was asked regarding the final rating. I sat there giggling over not the argument, but the amount of time that you each spent saying that the other was justified. To answer the question asked, I don't think that the lapel grab was over the top. I think that it's a sign that Odo has, over time, gotten better control of the urge for violence that Quark inspires in him. Even after listening to all the reasons both ways, I'd still have to stick with a five, even with the lack of sci-fi. DS9 is not a show that's built around exploration and science. It's a show that's built around characters and a place, and that makes the non-sci-fi episodes necessary to break up the pace. There's only so often that a sci-fi type problem will present itself in the stationary (no pun intended) environment. Most of the other stuff, I said already before the podcast, so, I suppose I'll leave it there. I dont know, the moral ambiguity regarding Dukat ended for me when he said, as a matter of factly, that the people dying in the mines were mere 'casualties" while the death of this Bajoran (whom we later find out is a collaborator) was "murder." When he said that, I felt a a shiver down my spine. A jolt. "THIS is evil" I thought. Pure, cold, hard, unadulterated evil. I have never liked Dukat - he's never even been a fun "bad" guy to watch and it bothered me often that the show never really went all the way with exposing that evil lurking underneath the facade. They always danced around it, or eluded to it - but never fully came right out and showed us how truly, epically and masterfully evil Dukat actually is - until 'Waltz".